Hailey Baldwin currently has a total of 19 tattoos. They might be small tattoos and not always visible, but they’re there. Justin Bieber and Hailey Baldwin are known for their tattoos, but Baldwin's not exactly on the level of her husband, (who has a bear, lion and eagle on his torso.) The 21-year-old model has spent her fair share of time at the tattoo shop, inking small yet sentimental marks here and there. Ahead, we’ve provided a rundown on most of Baldwin’s tattoo collection, from the special marks for her family to the small ink in honor of famous friends, like Kendall Jenner. At this rate, Baldwin’s tattoo collection shows no signs of stopping soon, and with a hubby like Bieber, she’ll have plenty of reasons to continue inking her body. Check out her tattoos and their meanings, especially if you want some small tattoo ideas for yourself. One of Baldwin's simplest tattoos is the outline of a heart on her shoulder, which she got in April 2011. The tattoo features a small heart with a thin black frame. Baldwin walked away from 2017's REVOLVE Festival with a brand-new tattoo. The model got two chevrons on her pinkie. The tattoo, which was inked by JonBoy, featured the two symbols at the base of her pinkie, pointing upward. In January 2017, Baldwin tattooed the French term Coeur d'Alene on her back. Baldwin is a devout Christian, which she nodded to with a cross on her neck right under her ear in April 2018. In October 2016, Baldwin tattooed the word unseen in the crevice of her spine on her lower back. Another of Baldwin's faith-themed tattoos is the word pray on her hands. The tattoo, which was designed by her friend Kendall Jenner, features half of the word on one hand and the other half on the other. When Baldwin puts her hands together, as if she's praying, the word is completed. In May 2016, Baldwin and her friend Marianne Fonseca tattooed the word gente on their hips, which means "people" in Portuguese and nods to Baldwin's half-Brazilian background. Her mom, graphic designer Kennya Deodato Baldwin, was born and raised in Brazil. In 2015, Baldwin tattooed the Roman numerals "VI-X-XC" on her wrist, which translate to the date "6-10-90" or June 10, 1990. The date is the wedding anniversary of Baldwin's parents, Stephen and Kennya Baldwin. This is the first tattoo the model received from her longtime tattoo artist, JonBoy. In June 2015, Baldwin tattooed the letter G behind her ear. The letter stands for "Georgia," the daughter of Baldwin's pastor Chad Veach, who was born with a rare brain disorder called lissencephaly. Of course, Baldwin and her best friend, Kendall Jenner, have matching tattoos. The models both have full and broken hearts on their fingers. Jenner's are in white ink, while Baldwin's are in red ink. “The one on my right hand is a full heart to represent an angel and my left is a broken heart—kind of like the devil side. Hailey and I have matching ones on the left side but hers is red," Jenner wrote on her website and app. On the middle finger of one of her hands, Baldwin has a gun tattoo. The tattoo, which features a gun pointing up, isn't one of Baldwin's favorites, but as she says, "It is what it is." @490tx - tbh I don't know why I have this tattoo... just another story to tell lol. It is what it is. "tbh I don't know why I have this tattoo... just another story to tell lol. It is what it is," Baldwin wrote on Instagram. Baldwin nodded to her Brazilian background again with a tattoo of the words Minas Gerais on her ankle, which is a state in southeastern Brazil. Baldwin has two tattoos on the side of her hands: the letter K and the number 3:30, which refers to the Bible passage John 3:30, which reads: "He must become greater and greater, and I must become less and less." 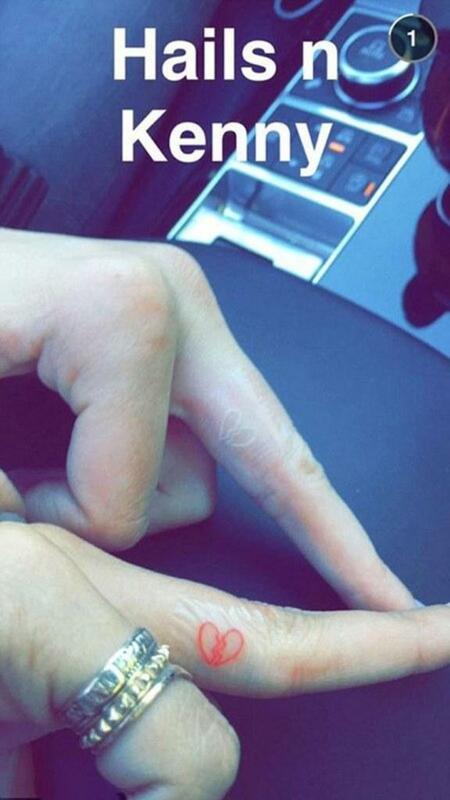 Baldwin and her cousin Ireland Baldwin got matching tattoos of their last name on their fingers in July 2015. The tattoos feature their last name in all lower case and cursive. In February 2016, Baldwin tattooed the word seek on the back of her neck. The word, which is in lower case and in cursive, is printed sideways vertically on her spine. Jason Pham is an entertainment editor at StyleCaster. He covers celebrity news, gossip, and love stories.